Recently there were a couple of things that appeared in the paper regarding the proposed NextEra wind farm that I found interesting. 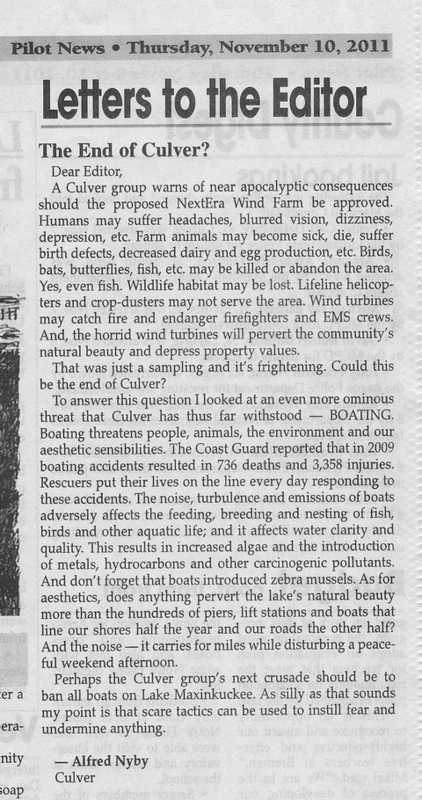 Alfred Nyby of Culver wrote an entertaining Letter to the Editor titled “The End of Culver” (click on it to the right to enlarge it) proposing that the Concerned Property Owners of Southern Marshall County take their arguments to the logical conclusion and take on all boating on Lake Maxinkuckee as their next target. I had to chuckle as I had previously expressed my concern that they were exaggerating the concerns here. Alfred’s letter appeared in both the Culver Citizen and the Pilot News. In the Pilot News, the Concerned Property Owners of Southern Marshall County placed a full page color ad titled, “What Have I Done?”. www.wind-watch.org/alerts/2007/12/27/what-have-i-done/ by Don Bangert While it was pretty heavy on the melodrama, I think this is a more straight forward approach. Taking on the role of educators and talking to the potential leasing property owners seems more likely to have the effect they desire and isn’t as over the top. If Mr. Bangert is an actual participant in a contract with a wind farm and regrets it, then his testimonial is worth considering. It sounds like NextEra will not be going before the Marshall County BZA before next Fall. Hopefully by then some of the emotion and rhetoric will have died down and the pro’s and con’s can be evaluated on a factual basis. I’m not sure if that’s possible at this point, but Culver as a Community would look better if it is.